Having never watched a single episode of 24 (I have the DVD box set sitting here waiting for me to watch!) I'm not personally excited by the news that the new series "Live another Day" is almost upon us and that casting info and series details have been released. I know a lot of people that love this show though and can't wait for 24 to be back on TV! Jack Bauer is back to beat the clock in 24: Live Another Day on Fox. 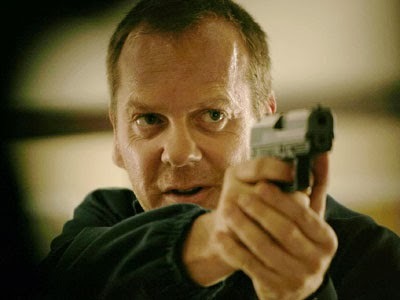 Four years after the Kiefer Sutherland series ended its run on Fox, the Emmy winner will pick up his gun again and slip back into the role of Jack Bauer for a 12-episode miniseries. "The foundation for any of this is going to be the writing, I have such huge respect for Howard [Gordon, executive producer]," Sutherland said. "If he says I don't think I should do it anymore, then we end it. If he says we should, then I'm going to say ‘OK, let's go,' so I'm very excited." The show picks up four years after viewers last saw Jack Bauer. He's fled the US and been in hiding. Live Another Day is set in and will shoot in London. The current TV president will make his way to London for a summit with the prime minister and Jack Bauer intercepts some intelligence "that lets him know something very bad is going to happen there that I can't tell you about," Sutherland told E! News. Jack Bauer resurfaces "and everything kind of collides." What's Jack Bauer going to be like when 24: Live Another Day hits TV screens? "He's going to be harder, he's angrier," Sutherland said. Joining Sutherland is Mary Lynn Rajskub. She'll reprise the role of Chloe from the original 24 series. Rajskub said she was "shocked" to learn 24 was coming back. "It took me a day or two, or a week, to warm up to the idea," she told E! News. "And then I kind of loved it. It sort of makes sense. I like that it's going to be the 12 [episodes]...It makes a weird kind of sense." So far Rajskub has only read the first two episode scripts, but promised it has "elements of old 24 and new, all in one." "I think it's got a lot things that's going to satisfy the fans," she said. "When you find Chloe, she's just somewhere we've never seen her before. She's in a bad, bad spot…I've gone anti-government and when Jack and I are finally reunited, we're not seeing eye-to-eye and he's being hunted by a CIA agent." That agent? Chuck's Yvonne Strahovski. The cast for 24: Live Another Day also includes William Devane, Giles Matthey, Gbenga Akinnagbe, Michael Wincott and Judy Davis. 24: Live Another Day premieres Monday, May 4 at 8 p.m. on Fox.